I don’y even care if this was a photo-op. Mayor Cory Booker rocks for responding personally to the tweets of a tv reporter and her camera man concerning a poor dog sitting on bare concrete in the freezing cold. If you know of pets not being properly protected from cold weather, please do something. 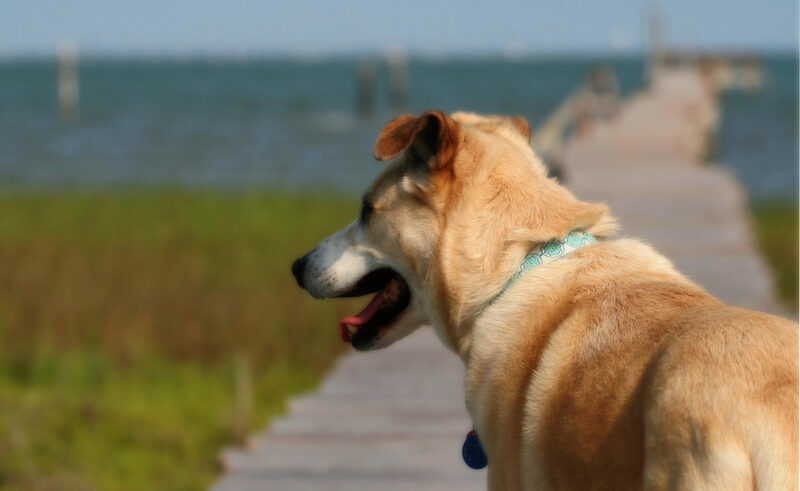 Try talking to the owners—maybe offer to help find a solution. If that doesn’t work, let animal control and animal welfare groups know there are pets in danger. 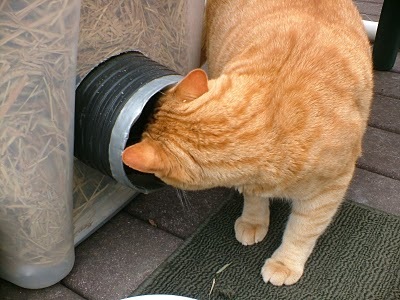 Don’t forget, when temperature drop below freezing, water bowls freeze over unless they’re heated. So, even if a dog or cat has shelter, it may not have access to water. 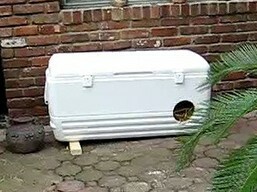 Pet cats living outside and stray & feral cats have a really hard time in winter—those low temperatures can be deadly. 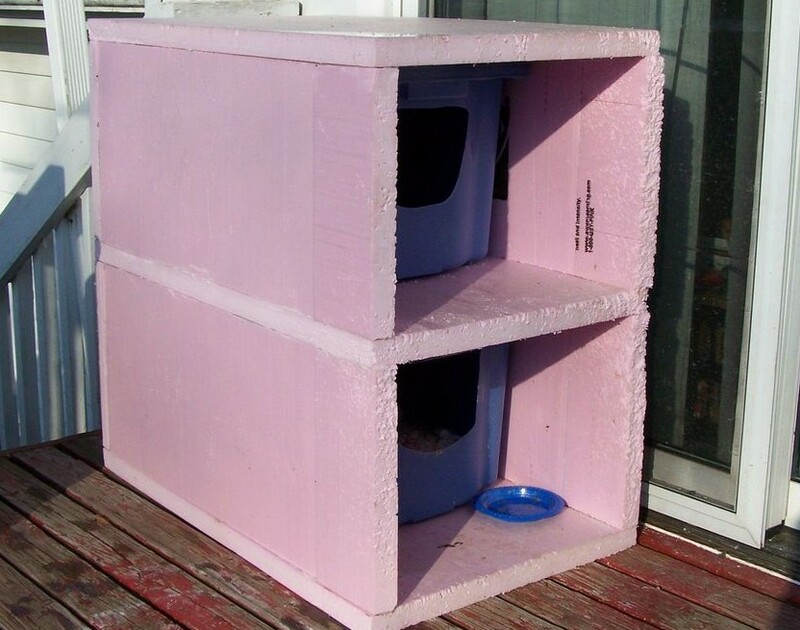 If your neighborhood has cats living outside and if your living situation allows, here are some inexpensive, DIY shelters you can make to give them a warm, dry place to sleep. Obviously, don’t place the house where a dog can get to it, or where your indoor cats can see it, if your cats are threatened by strange cats in their territory. Seeing a strange cat outside can disturb indoor cats and trigger redirected aggression where they attack other cats in your house. If there are predators like raccoons, coyotes, bobcats, etc. 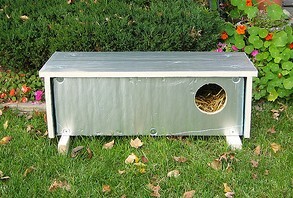 in the area, cut a hole in the front and the back of the shelter so cats have a way to escape. 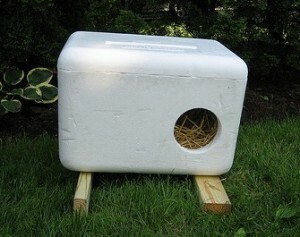 The Urban Cat League has several designs for easy, low-cost shelters. The styrofoam cooler house is probably the easiest and cheapest shelter. (Find instructions & materials needed here.) 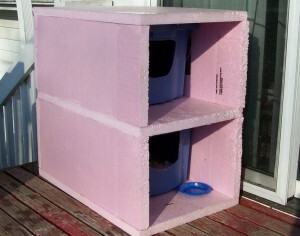 The shelter intentionally tilted so that in case any water gets inside, the high end stays dry for the cat. The picnic cooler house is also pretty easy and used coolers can often be found at thrift stores and garage sales. (Find instructions & materials needed here.) This shelter will be quite durable. It’s also tilted to the high end stays dry even if water gets inside. 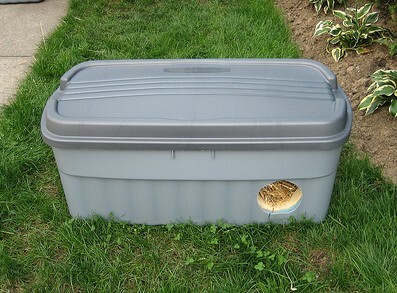 The insulated storage bin house is lined with foam core insulation that’s moisture resistant and has a foil covered side to reflect body heat back towards the cat. (Find instructions & materials needed here.) This shelter has drainage holes for any water that might get inside. The foam core insulation house is made by bolting together the rigid foam insulation using large washers. (Find instructions & materials needed here.) This design places the entrance higher to keep bedding inside. It also has drainage holes. The Ian Somerhalder Foundation (yes, that Ian Somerhalder) has a design for an insulated 2 bin house. This is another easy one that doesn’t take much work or require many tools. They also suggest lining the inner compartment with a mylar blanket to reflect the cat’s body heat. These blankets are found in the sporting or camping section of discount stores. This insulated condo won’t win any beauty contests, but it is clever, low cost, and easy to make. The exterior is rigid foam insulation glued together with heavy-duty construction adhesive. Two storage bins serve as the inner compartments.